Pros: Pretty sweet piece and well worth the price.They could easily ask more and many would pay it.Smokes great,thick glass and for sure a cool design. Cons: Only one of the gills at the bottom of the down stem for the ash catcher was cut clean through,so that feature doesn't work properly. 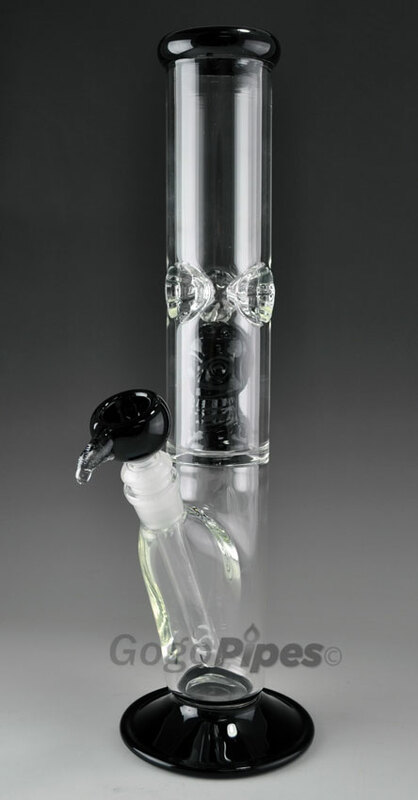 Pros: 7MM GLASS, SKULL PERC SURROUNDS THE INNET PERC! KILLER LOOKING PIECE! SOLID STRUCTURE & RIPS & JUST RIPS WITHOUT A HINT DUE TO THE DOUBLE CHAMBER PERC MAKING IT A SILENT KILLER,BUT IT WILL GETCHA^^ Guarantee something like this'll be at least $300. Cons: The neck is noticeably thinner than the overall glass of the pipe,so have to be cautious. If was equipped with 27mm solid joint,it'd be perfect. The hole of the bowl is huge.. Comments: Great quality value overall as usual. Pros: This was a great investment. Thick glass...beautiful product. Makes taking my medicine so much easier...smooth awesome hits! Will buy more products from this site! Comments: stock up on some hypodermic needles please? Cons: the diffuser end of the downstem came broken. Comments: gogopipes.com is the only place i will buy from now. Pros: Perfect size with a nice mouth piece, and the perk makes it hit so nice too. Ice pinches are ridiculous and whole bong looks soo sick. Pros: Very smooth/thick hits.... and it's the perfect size. Best bong i have used! Will definitely buy from here again!!! Comments: Be sure to get an ash catcher to keep it really nice, especially if you use it often.....i'm planning on picking one up soon :~) Thx for the great bong! This Glass on Glass skull percolator glass water is thick. it has skull as percolator and ice pinch or icecatcher just on the top of the skull perk. Ice will make it smoother. Nice flat base helps keep it stable. Size of Skull Percolator Water Pipe is just Perfect.